The Sizzle didn't shrink. Well actually that's not totally true. It did shrink lengthwise. It is definitely shorter now. The problem is, it's still just as wide which was the problem. In fact it just may be wider. Ugh. I see it heading to the Goodwill Box. No knitting last night. I had a Habitat for Humanity board meeting that ran over time and I was exhausted when I got home. Tonight is MS Golf Tournament meeting and babysitting Benny and Corie. My sister and brother-in-law are out of town so I'm going to be substitute Granny tonight. I'm going to take my STR socks along and try to get a few rows in, but I don't see it happening. That Benny is on the move these days. Terrible twos. I bought some gorgeous lace weight at my LYS on Saturday. It's pale pink. I have no clue what to do with it but I had to have it. Having lace on my mind and all. I left it there to be wound. That probably took all day. There was a ton of it and it is so fine. I forget the name of it but wow, it's soft and beautiful. Oh, one more thing... I just read that they dropped their case against John Mark Karr in the JonBennet case. Gee. Go figure. Duh. Was there anyone who actually believed he was guilty? Laceweight yarn? Holly, do I see some lace knitting in your future? Sorry to hear about Sizzle, such a shame. Is there any way to take it in more on the sides so it's not nearly as wide? I'd hate to see all that work wind up in the Goodwill bin. 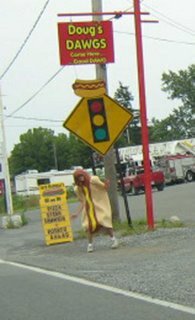 I love the dancing hotdog. Down here we have a "moonwalking" Quizno's drink. One day a few weeks ago, the Quizno's drink got beat up...right on route 30!!! The kids who did it thought they were being funny --and were arrested. Is there any possible way to take the sides of Sizzle in at all. Maybe sew it on the sewing machine with some bias binding. Pssst....How Many Months Along Is She???? By Jove, I Think She's Got It!